At this year’s FT Global Pharmaceutical and Biotechnology conference, pharmaphorum’s Paul Tunnah sees the winds of change blowing through pharma, as delivering value force it to embrace big data, new technology, closer collaboration and new R&amp,D approaches. Attending the FT Global Pharmaceutical and Biotechnology conference last week it was fairly easy to tell what is keeping senior pharma execs awake at night, even before anyone spoke. The word ‘value’ appeared in no less than three of the session titles over the two days of the event, with terms like ‘innovation’, ‘partnership’ and, of course, ‘patient’ being highly visible too. The fact that the title this year was ‘Value at risk? The role for life sciences in the new healthcare era’, further exemplified the key issue at hand. Always attracting the most senior level participants in the industry, if you want to know how the industry is dealing with current challenges then this is a good place to hear about it. To try and provide an in-depth analysis of the full conference within the scope of this article would not do it justice, but here are some of the key highlights for me. 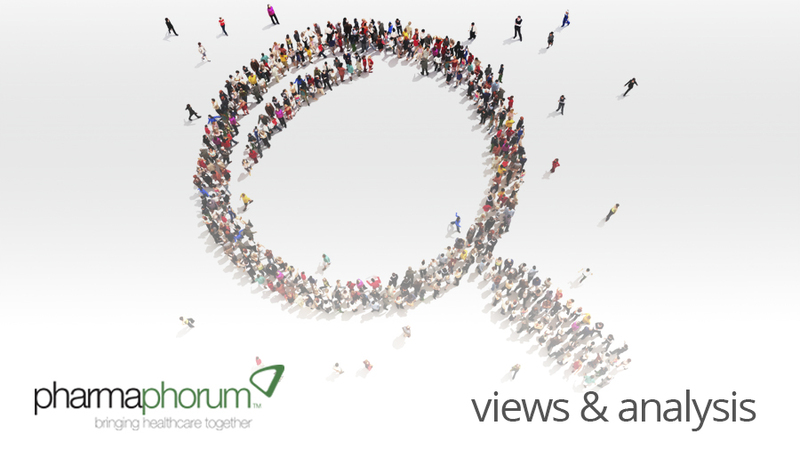 The consensus seems to be that delivering value in a commercially viable way is the single biggest challenge for pharma in the next decade. Estimates for drug development were quoted as being between $800m and $2.7bn fully loaded cost (the latter from a recent McKinsey survey, quoted by UCB’s Ismail Kola). Unless pharma can recoup these costs on a regular basis it’s a pretty short story, as although drug costs are only around 8% of total healthcare costs (UK), they are an easy target for savings – a bit like company travel budgets, declared Novartis’ Corinne Savill. Assessing the cost-effectivemess of medicines is therefore becoming an ever more elaborate affair, with value-based pricing (VBP) just round the corner. Sir Michael Rawlins, from the UK’s National Institute for Health and Clinical Excellence (NICE) admitted that economists could not agree on the right metrics to assess value in VBP, but did stress that numerous other countries were requesting advice on this approach, so it will surely become a global issue before long. The real threat from VBP is that incremental innovation might find itself failing to deliver, with the consequent result that certain diseases could face an innovation gap for an entire generation. This point was well made by Ulf Wiinberg, CEO of Lundbeck, who warned against neurological disorders becoming the modern day equivalent of antibiotic development, with a number of sizeable pharma companies having already retrenched from this area. If there is light at the end of the tunnel in this debate it comes from recognition by Sir Michael Rawlins that one cannot purely look at medicines value on economic measures, as this would inevitably lead to the conclusion that keeping anyone alive is a bigger healthcare burden! So special consideration for certain ‘tough to treat’ disease areas is likely to become more common. 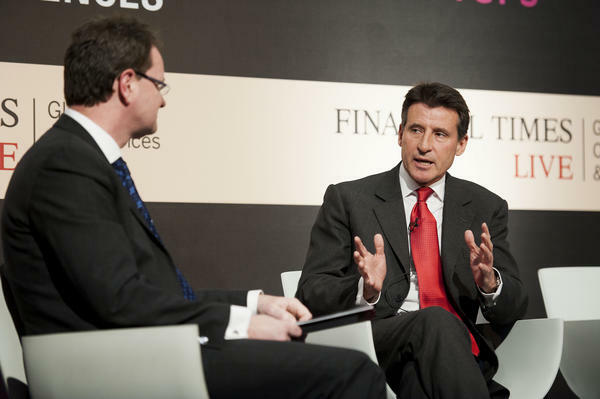 Event sponsor Deloitte’s Simon Hammett interviews Lord Sebastian Coe. Picture courtesy of the Financial Times @FTLiveTweets twitter stream. Can technology and big data save pharma? Personalised medicine has often been quoted as the right direction for pharma – development of more specific medicines that can deliver real value in more defined patient populations. However, such targeted therapies require two key additional components to really perform, in the guise of diagnostics and accurate, dynamic real-world information, otherwise known as big data. GE Healthcare’s CEO John Dineen, speaking at the event, prefers the term ‘precision medicine’ and believes that we are only 5% of the way along the journey from true connectivity between diagnostics and treatment. Ulrich Schriek, from diagnostics manufacturer QIAGEN, reminded the audience of the importance of factoring in companion diagnostic development very early on. After all, as Serge Bernasconi (MedTech Europe) pointed out, diagnostics may only be 3% of healthcare costs but they direct the remainder. As for big data, Professor Sir John Bell described real-world data as no longer a ‘nice-to-have’, but an ‘essential tool’, before going on to explain that incentives around accurate data collection were critical, citing the UK’s HES (hospital episode statistics) data as one example where payment to code improved quality. No mention of big data could avoid touching on the knotty subject of data transparency, which is a real hot potato at the moment following the publication of Ben Goldacre’s Bad Pharma. Opinions seemed to vary on how open pharma could be with its data without compromising competitive advantage and / or regulations, but Sanofi’s Chief Strategy Officer, David-Alexandre Gros, seemed to be a vocal advocate from the C-level of opening up – provided the industry moves together. Ultimately, access to new technology and big data might not be the biggest challenge. Cavan Redmond, Chief Exec of WebMD, pointed out that getting people to change habits in the face of clear data remained a big challenge. As he succinctly observed, doctors might need rigorous medical training and a license to prescribe a $150k drug, but patients just need a prescription to take it. Nevertheless, areas such as diabetes and integrated oncology treatments are good areas to watch if one wants to see the emerging healthcare impact from the confluence of drugs, technology and big data. Times of economic hardship historically drive innovation, diversification and closer collaboration, something which can be observed in pharma right now. A general theme of many discussions was around pharma progressing more toward delivery of broader services centred around drugs, such as Janssen’s integrated schizophrenia care project or MedImmune using its specialised biological manufacturing capabilities to work with historical competitors. MedImmune’s President, Peter Greenleaf, went on to confirm that partnership discussions could now take place as early as target validation in order to plan ahead commercially. Israel Makov (SUN Pharma) went further, talking of his move to create disease focussed clusters of companies, with reference being made to the TransCelerate BioPharma model a number of times. However, despite the talk of collaboration and emerging markets (Steve Yang, from AstraZeneca, showing photographically the growth of 400 life science companies in Shanghai from nothing in 20 years), the elephant in the room remains – the need for a more efficient R&amp,D process. GlaxoSmithKline’s Moncef Slaoui, always a vocal speaker on this topic, pointed out the need to stop ‘pumping up the tyre’ and actually change it, stressing the importance of early culling of non-viable projects to reduce costs – before claiming that he has tripled their phase III pipeline with the same budget, in part due to this approach. Israel Makov reinforced the point, asking the audience what other industry has not changed its product development process in 25 years? Finally, Roche’s Franz Humer, one of the more experienced industry veterans at the event warned against two dangers. Firstly, that too much collaboration can be counter-productive, with competition driving speed, and secondly that external support is required – expressing a vocal view that continental European governments lag significantly behind the US and UK in paying for pharma innovation. His sense of urgency for change was palpable as he made a very clear point that pharma needs to adapt now – to wait and see is futile. But surely the last word has to go to the Lord Sebastian Coe, special guest interviewee and the man that so successfully delivered the London games of 2012. The personality required to be an Olympic gold medal winner shone through in some simple advice for pharma – ‘keep improving or don’t bother doing it at all’. Check out “The story on Twitter from the FT Global Pharmaceutical &amp, Biotechnology Conference 2012”, curated by pharmaphorum on Storify. pharmaphorum will be publishing individual interviews with some of the attendees from this event over the next few weeks. Can technology and big data deliver value for pharma?